DPB2U-AB Series 2u dc breaker panels provide distribution and overload protection for up to 18 DC circuits. They distribute up to 300 amperes of load current for each A or B bus, with each bus having up to 9 circuit breakers. Each bus on these 2U dc breaker panels can be independently configured for 12, 24 or 48 volts positive or negative grounds. Magnetic circuit breaker capacities are from 1 to 100 amperes. The breakers can be removed and replaced from the front of the unit by disconnecting on the back and removing the front panel cover. Optional breaker alarms have dual-color LEDs (green/red) and Form C relay contacts.The input bus terminations are to copper bus bars. 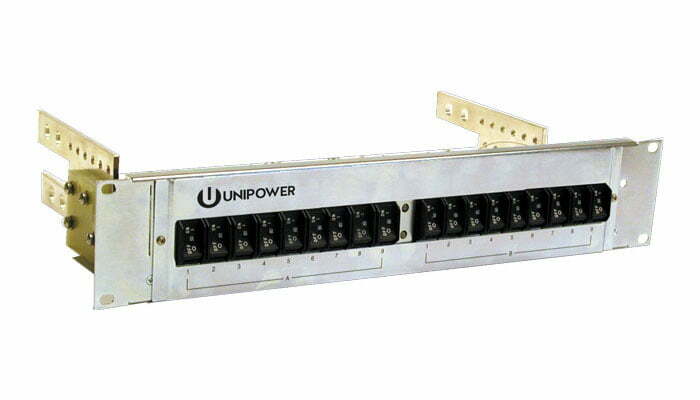 The 2U dc breaker panels can be ordered for mounting in either a 19- or 23-inch relay rack. They are flush mounted to the rack. NOTE: See ordering guide for complete model configuration.